Mice, rats, and other rodents are nature’s experts at gnawing. Their sharp incisor teeth give them the tools they need to chomp their way through paper, plastic, cardboard, plywood, electrical insulation, and even many of the less expensive materials used to get rid of them. If you are planning to go to war with rodents using glue traps, you will have success. However, you will be considerably more successful if you use glue traps together with snap traps for mice or snap traps for rats, depending on your rodent problem. However, keep reading this review to learn all there is to know about trapping rodents with glue traps. NOTE: Click a link in the “Table of Contents” below to jump straight to any part of the review. What’s the First Thing You Need to Do to Use Glue Traps for Catching Rats and Mice? Where can you buy the CRANACH Glue Boards? A glue trap is a sticky flat surface designed to hold a rodent in place until it can be conveniently removed. A glue board trap is a flat surface coated with 1 to 2 mm (about 1/25 to 1/10 of an inch) of glue. Glue boards can be placed on flat surfaces, or some brands can be folded into tents that trap the rodent on all sides. 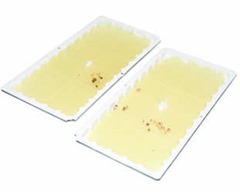 A glue tray trap is a flat surface coated with 4 to 6 mm (about 1/5 to ¼ of an inch) of glue to capture a rodent by its whiskers, underbelly, and feet. Glue tray traps are not folded into tents. Both styles of traps are available in different sizes for mice and rats. Many products come with a plastic or cardboard cover that lures the rodent inside the trap. The first thing you need to do to make sure glue traps work for you might come as something of a surprise: Clean up the area where you want to catch mice and rats. The less dust, dirt, and debris you have in the area you want to clear of rodents, the stickier the glue on the glue traps will be. Accumulations of house dust and dirt give rodents the traction they need to escape the glue trap. Rodents can use little bits of trash and debris to build bridges over glue traps so they can continue running the same paths through their territory without risk of capture. Scientists have observed mice making up to 100 trips a night to carry trash to build a bridge over a glue trap, but when it’s finished, the mouse scent on the trash directs the rest of the nest to scamper over it safely. If there’s no trash, they can’t build a bridge. Glue traps also fail to capture rodents with wet or dusty feet. Humidity control will help you not just with insect problems but also with mice and rats. Air filtration (HVAC or floor-standing room air filtration units) address not allergy and asthma problems but also rodent control. After you have cleaned up your target site, priming it for success, the next thing you need to do is to choose the right glue trap product for the rodents causing your infestation. If you have mice, you will want to use glue boards. Glue boards lie flat (or nearly flat) on the rodent runway. A mouse out exploring its territory will scamper right on to them—but not if it has to stop and inspect the edge of a tray. A rat, on the other hand, is much more cautious. A rat needs to feel secure that an object is “supposed” to be in its territory. If it inspects the edge of the glue tray one night, and the next, and the next, eventually it will lose its inhibitions and step right in. Or it will try to pass over the glue board in a flying leap. But you can use the rat’s evasive maneuver to your advantage. What do you think happens when you set out two glue traps about an inch (2.5 cm) apart? If the target rodent jumps over the first glue trap, it lands in the second. But don’t put both glue traps out on the same day. Put out glue traps about every 5 to 6 feet (1.5 to 2 meters) in the rodent runway. Wait a day, removing the rodents you have already caught. Then put a second glue trap next to the first. That way rodents who have gotten used to running around the first glue trap will get stuck in the second. Remember, Any Time You Handle Glue Traps…. 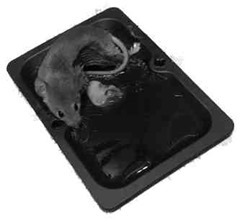 Glue traps have a strange, chemical smell for most rodents. The smell of glue, unless there is a peanut butter bait in the middle of the trap, repels mice and rats, especially rats. But if you get your human scent on the trap, too, you will only succeed in sending more and more mostly adult mice and rats away. Remember, any time you handle glue traps, wear gloves, to avoid transferring your scent to the trap. Still Have Questions About Glue Traps – read our glue trap FAQ. If you have a variety of pests to trap and you don’t want to spend a lot of money, this economical pack of 5 CRANACH glue boards is the right product for you. If you have read my general discussion of glue traps, you know that you need to put out glue boards in pairs about an inch (2.5 cm) apart. And you know that you need more than just one glue board per room. You need to place pairs of traps about every 4 to 6 feet (2 or 3 meters) around a room, everywhere your pests may go. For most home and small business uses, this CRANACH pack is exactly what you need to clear a single room of pests (although it’s always better if you use a combination of glue traps and snap traps to get rid of mice and rats). The sticky side of each glue board is the side that doesn’t have the writing on it. You expose the glue by lifting a corner of the adhesive backing and giving it a good pull, while holding the board flat. Place the gooey surface up to catch rodents and other pests. If you don’t pull off the paper over the sticky side, the board is not going to catch anything. This particular product gets really sticky at summer temperatures, so to make the job of pulling the backing away easier In summer, place the box in the freezer for about 10 minutes, and then put out the traps. There are no toxins in the product that could contaminate your food. This CRANACH product can be used in a humane manner, if you check early every morning. Wearing heavy gloves so you aren’t rewarded for your kindness with a bite, you can take trapped animal and glue board both outside and spray the animal with vegetable oil. This loosens the oil so it can escape. You can help by holding the animal by its tail (again, with a gloved hand, for your protection and its, too) while it wriggles free. Then just let the animal go. The appropriate number of glue traps to put out isn’t one trap per room. It’s one box per room. If you don’t put out enough traps, rodents and other animals will just learn to travel around one or two obstacles rather than being forced to deal with a trap. You can check out the prices of these traps at Amazon by clicking here. Before you get started, clean up the middle of the room you want to clear, but don’t clean up droppings and urine. If you have less dust in the air, you’ll have stickier traps. If rodents can’t find debris they can use to make a bridge over the glue trap (a process that takes a single mouse about 100 trips a night), they are more likely to get caught. You want to leave the feces and urine, for now, because rodents use them to navigate at night. The scent of the bait on each glue trap was designed to lure rodents, not people. You won’t like the smell but mice and rats will. In fact, if you are close enough to the traps that the odor of the bait is bothering you, you probably have put them out in the wrong place! Rodents like to travel out of sight of humans. You should not use this product in your bedroom, living room, or kitchen, expect under the sink, stove, or refrigerator. And with them, you place the glue traps not at the first place a rodent would go under these objects, but farther back, where it would feel more secure. You can use the scent to your advantage with a bait and switch. Before you put out any glue traps, just leave little bits of peanut butter in the rodent runway. Let them enjoy the free treat so they come back for more. Then the next night (or, better, after you do this for two or three nights), put out the peanut-scented glue boards. If you are trapping pests in an unheated storage room or basement during winter, you may need a product that’s stickier in cold weather, like Tomcat Mouse Size Glue Traps, 4-Pack (Eugenol Formula). One of the most reliable places to buy these CRANACH traps is at Amazon. They offer fast delivery and free shipping for orders over $35 or free shipping if you are a Prime member. They also have an excellent returns policy. Here’s a product that is extremely easy to use. There are no adhesive stickers to remove. You don’t have to worry about the product’s being cold enough or warm enough for maximum trapping power. Just open the package, unfold the trap, and set it in place. 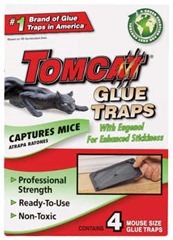 Tomcat glue traps with eugenol are excellent for unheated spaces in winter, like an attic, basement or outhouse. The addition of eugenol to the glue acts as a kind of antifreeze. The trap stays sticky down to about 18.5°F (-7.5°C). Eugenol is a natural product. It’s found in cinnamon, cloves, basil, dill, and vanilla. It’s completely nontoxic, as is the glue and everything else in the trap. This product is for mouse control, not for rat control. Other products are needed for rats. You really need more than one box of glue traps for a room. Four traps are enough for a closet, though. It’s always best to put out glue traps in pairs, about an inch (2.5 cm) apart. That way if the mouse jumps the first glue trap, it lands in the second. Ideally, you would use a dozen of these traps for a basement or storage room. Glue traps have to be put out in the right places. Mice don’t venture out into open spaces unless there’s an emergency. They like to keep their whiskers pressed against a flat surface as they patrol their territory. Don’t place glue traps in the middle of a room. Place them along a wall (in pairs), not in a corner, not too close to a door, and never directly in front of a mouse’s hole. If a mouse discovers a trap right in front of its entryway to the room you want to clear, if will just find another hole and avoid the trap altogether. These traps are baited with a banana scent. You can use this to your advantage by giving the mice free samples before you put out the traps. Put on gloves (so you don’t transfer your scent to the bait) and slice a banana, or put out banana chips in the rodent runway the night (or even two nights) before you put out the traps. That way the mice are primed to look for a free lunch and more likely to step into the banana-scented tray. It’s also a good idea to wear gloves when you are putting out the traps, so you don’t transfer your scent from the sweat on your hands. 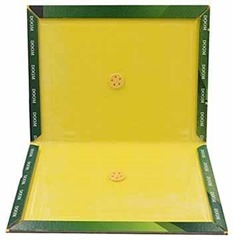 This product can be used as a glue tent (just fold as directed), but you will probably get better results placing it flat—unless you are using the trap in complete darkness. If mice can see a tunnel in front of them, they stop to check it out with their whiskers before they enter. This makes it less likely they will get stuck in the trap. You don’t have to kill mice you catch in these traps. Wearing heavy-duty gloves so you don’t get bitten, place the trap in a plastic container larger enough let the trap lie flat, with edges at least 4 inches (10 cm) high. Spray the mouse with vegetable oil. Then hold the mouse by its tail to help it wriggle free. Do not take off your gloves during this process, and do not use the container for food storage after using it to carry the mouse outdoors. Use both glue traps and snap traps for maximum effect. If you don’t get them in one trap, you will get them in the other. This is the product you need for an infestation of mice in a poorly heated room during winter. I always find Amazon is one of the most trustworthy places to buy goods online. They offer very competitive prices, speedy delivery and are extremely helpful if you have any problems regarding your order. Click the link to check prices on Amazon. This glue tray attracts fewer mice and rats, but it also allows fewer rodents to escape. If you have had a problem with mice and rats that run away with other glue traps, and especially if your problem is with rats more than with mice, this is the product you need. Mice, except for young mice, tend to shy away from glue trays until they have been in place for a few days. They encounter the edge of the tray, and instinctively scurry around it. A rat will assume it can just jump over the tray—which is why this product comes as six pairs of trays. Often the rat will jump over the first tray it encounters, but because these trays come in pairs, it will get trapped in the second. The heavy plastic construction makes it impossible for the rat to gnaw its way out, keeping it trapped until you choose to kill or release it later. Don’t order these trays with other items, especially food items for your personal consumption. Order them as a stand-alone item. Many people order this product to help them control rats and mice that are attracted to outdoor fruit or avocado trees. Place a metal collar around the tree to stop rodents from getting the fruit or avocados, and you will have less of a problem indoors. Don’t expect one trap or one pair of traps to do the job for you. Traps should be set out about every 4 to 6 feet (2 to 3 meters) around the perimeter of the room to make sure you don’t just provide rodents with a single, easily remembered obstacle. Wear gloves when you put out traps. You don’t want to transfer your scent (from the sweat on your hands) to the trap. The night before you put out these glue trays, put out a few low-lipped trays that don’t have glue on which you have placed some peanut butter. This gets the mouse or rat accustomed to entering a tray to get a treat. Then remove the decoy tray and replace it with the peanut butter-scented glue trap. Don’t bother making “tunnels of death.” They don’t work except in total darkness. Mice and rats are always on the lookout for new holes into which to scamper, but they identify holes by sight, and they check out the safety of these potential escape paths with their whiskers before they go in. They will detect the glue in a tunnel trap before they ever go in. Store the trays flat. Don’t store the box on its side. The glue may drain off the trays. This product isn’t designed to be used with poisons. The scent of a poison may cancel out the attractant on the trap. And if the poison were to work, the mouse or rat might die someplace very inconvenient, like inside a wall. This product isn’t designed for use at cold temperatures, below about 50°F (10°C). F tor cold-temperature trapping, use a product that mixes the glue with eugenol. If you get good results with the first box, don’t put the traps from the second box in the exact same places. Any rats you may have missed in the first round of trapping will remember where you placed the other traps. When the product doesn’t catch rats but does catch larger targets, like your small child, the problem usually is that the glue surface has become coated with dust or dirt. Dust on top of the glue provides just enough traction for the rat to escape, something like putting kitty litter under your tires when you’re stuck in the snow. That dust doesn’t provide enough traction for a pet or child to pull the trap off easily. (And you shouldn’t put out glue traps where children or pets roam.) A quick vacuuming of the room where you want to put out trips—leaving the rodent urine or droppings that they use to navigate at night—helps your traps work better. Glue traps aren’t designed for outdoor use. Rain and snow can dissolve the glue, wind can blow them away, and larger animals can carry them away. Rat and mice are mostly indoor animals. The glue on these traps comes off with baby oil—from children, pets, and rodents you decide to release to the wild. As with the other glue traps, I suggest your first port of call is Amazon. They offer some of the most competitive prices online and give very good customer service, which is backed up by their excellent return’s policy. Click the link to check-out their prices JT Eaton Pre-Baited Rat Size Double Glue Trap Tray. CRANACH 5 Piece Mouse Trap, Glue Boards. — one question “How sticky are these boards in cold weather?” I have a field rat (small) under my deck (outside) and the snap traps I have put out, are being ignored. Now we are going into the winter months here in Washington State, I would like to known if the glue stays pliable or if it firms up in cold weather and looses it’s stick. For cold places, you want to use our 2nd recommendation, the Eugenol traps which are designed for use in unheated places.